Many women with Polycystic Ovarian Syndrome (PCOS), though not all, experience insulin resistance. Insulin resistance happens when the hormone insulin becomes less effective at lowering blood sugar. High blood sugar levels may prevent ovulation and insulin resistance may impact the development of an embryo should fertilization occur, as well as interrupt the ability of the egg to properly implant in the uterus after conception. One way to support healthy blood sugar levels is through dietary modification. 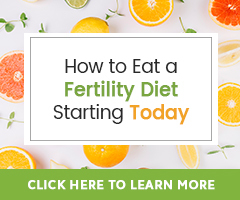 Eating a PCOS Fertility Diet may increase the rate of spontaneous ovulation, significantly improve the environment of the uterus, decrease the potential for miscarriage, and prevent PCOS from turning into diabetes. Research shows that consuming meals that contain little to no protein, but are high in processed carbohydrates, sugar, and/or white grains (white flour, processed wheat flour, white rice, etc.) – which have a high glycemic index, can induce inflammation and blood sugar imbalances. By eating meals with a disproportionate protein to carbohydrate ratio, you may be filling your body with foods that contribute to hormone imbalance and elevated insulin levels. To stabilize blood sugar, the KEY is to eat 5 small meals throughout the day that contain a balanced proportion of protein to carbohydrates. This will help to eliminate the insulin yo-yo and support stabilized blood sugar. Protein – As a general rule, eat more protein from vegetables than from animals. If you eat animal products choose grass-fed, organic and free-range animal products. A woman needs to consume 46 grams of protein per day while trying to conceive. Steel cut oats, legumes/beans like chickpeas and lentils, tempeh, and spinach are just a few sources. Raw seeds and nuts sold in the shell, or homemade nut and seed butters: Sunflower seeds, sesame seeds, pumpkin seeds, almonds, walnuts, chia and hemp seeds, and Brazil nuts. Cold-water fish, cage-free eggs and chicken, lean cuts of grass-fed beef, and grass-fed dairy (yogurt and cheese), and protein powder such as FertiliWhey. Carbohydrates – Now, not all carbohydrates are the same. Choose fresh, whole foods because these provide high fiber, low sugar carbohydrates. Keep reading to learn what these whole foods are. Some people think that eating carbohydrates will make them gain weight, but the fact is that eating too many of the wrong carbohydrates (pastries, crackers, white pasta, white rice, etc.) is what results in weight gain. Whole food sources of carbohydrates contain important nutrients that can help you feel full longer and give your body energy. Whole Grains – Barley and quinoa are good for blood sugar regulation. Choose these or sprouted bread, rice pasta, brown rice, teff, millet, amaranth, or buckwheat, even wild rice. Fruits – Blueberries, mulberries, apricots, apples, grapefruit, oranges, pears, raspberries, avocado, melons (including watermelon), prunes, and plums… just to name a few. Vegetables – Peas, carrots, celery, brussels sprouts, bitter greens, sweet potatoes (not regular white potatoes) and yams, artichokes, olives, burdock root (“gobo”), cabbage, turnips, kale, chard, zucchini, peppers, leeks, onion, garlic, cucumber, lettuces like arugula, romaine, etc. (not iceberg), radishes, turnips, parsnips, carrots, broccoli, cauliflower, green and yellow beans. High fiber foods – Fiber helps remove excess estrogen from the body which can be helpful for some reproductive imbalances. Dark leafy greens, brassica vegetables like broccoli and cauliflower, quinoa and other whole grains, beans, lentils, freshly ground flaxseed, fresh fruits, organic popcorn (popped yourself, not pre-bagged), sprouted or whole grain bread. Spices – Horseradish (fresh root as opposed to a prepared sauce), garlic, onions, cinnamon, fenugreek, tarragon, coriander and allspice. Changing Your Diet Today Will Change Your Health Over Time! For women with PCOS, focus on controlling daily blood sugar levels for at least 3-6 months (the longer the better) prior to trying to conceive; this will support weight loss or encourage a healthy body weight and will reduce the risk for developing type 2 diabetes. While it may seem daunting to have to change your diet, it is one of the best ways you can improve insulin resistance and your overall health, with the added benefit – an increase in fertility. Women living with PCOS who educate themselves about healthy nutrition for PCOS are more likely to be successful at changing their health. It is important to learn how to read nutrition labels so you know what you are putting into your body and to understand Glycemic Index (GI) and Glycemic Load (GL) [the glycemic load of a food, rather than the glycemic index, is often the most accurate predictor of the body’s after-meal insulin response] of foods on the grocery store shelf. Modify your diet by learning how to make and eat well balanced, whole food meals every day in order to reduce cravings for sweets, improve digestion, and balance blood sugar levels. Lemon juice is a source of vitamin C and supportive of healthy liver function. It will benefit you most however to consider the dietary tips here, as well as those in our guide How to Reduce the Damaging Effects of PCOS on Fertility Through Diet and Herbs. I am sorry this has been so hard for you! I send a virtual ! It may help to learn what causes POF and how the body can be supported through natural therapies. We offer that information in our guide to Understanding Premature Ovarian Failure. Given all that you are dealing with and trying so far, it may be most helpful to have personalized support from a fertility herbalist. We offer this through a Fertility Consultation.